1. Ignore everybody. People often can’t handle good, original ideas for great places until you build them, so ignore them until then. 2. The idea doesn’t have to be big. It just has to change the world. Think less of revitalizing an entire community by yourself, think more of helping build a great place in a community that sets the standard… to change the world. 3. Put the hours in. It takes years, sometimes decades, to effect change in a neighborhood. If you’re committing any less, forget about it. 4. If your biz plan depends on you suddenly being “discovered” by some big shot, your plan will probably fail. Don’t wait for those magical investors to appear to finance your development. They won’t come. Start building on your existing relationships, now. 5. You are responsible for your own experience. Don’t stunt the growth of your experience waiting to be ‘discovered’ or having that ‘big idea’ or the ‘right opportunity’ – find what you can do now to make a difference in your community and start immediately (ie join a beta community). 6. Everyone is born creative; everyone is given a box of crayons in kindergarten. And you know what, in Syracuse people are once again finding that box of crayons as they co-develop their very own place to live, work and play. 8. Companies that squelch creativity can no longer compete with companies that champion creativity. This is essentially the aforementioned fact that creativity drives the economy now more than ever, so if you’re not working with a creative developer or live in a city without creative leadership, prepare to be patient. 9. Everybody has their own private Mount Everest they were put on this earth to climb. When it comes to your own neighborhood, make it clear to everyone! An Italian piazza? A pedestrian-only district? Only local independent shops and restaurants? It may not be possible to ‘reach the peak’, but you’ll get a lot further knowing where it is. Everyone in a beta community gets to define their ‘peak’ as a ‘Personal Objective’. 10. The more talented somebody is, the less they need the props. 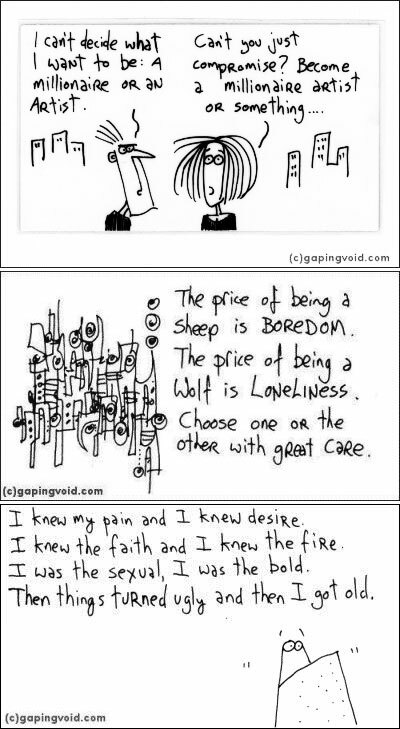 Props, as in tools, or ‘pillars’ as gapingvoid describes it, like the lousy tennis player with the $500 racket. If there’s one rule creatives live by it’s this one, which is why they’re creative, and why they seek out fringe neighborhoods – because they don’t need anything more. The luxury condos and trendy restaurants are for the less talented. Thanks to Rasul Sha’ir at Vosica for the reference.